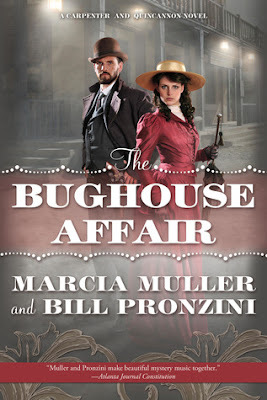 In this first of a new series of lighthearted historical mysteries set in 1890s San Francisco, former Pinkerton operative Sabina Carpenter and her detective partner, ex-Secret Service agent John Quincannon, undertake what initially appear to be two unrelated investigations. Sabina’s case involves the hunt for a ruthless lady “dip” who uses fiendish means to relieve her victims of their valuables at Chutes Amusement Park and other crowded places. Quincannon, meanwhile, is after a slippery housebreaker who targets the homes of wealthy residents, following a trail that leads him from the infamous Barbary Coast to an oyster pirate’s lair to a Tenderloin parlor house known as the Fiddle Dee Dee. The two cases eventually connect in surprising fashion, but not before two murders and assorted other felonies complicate matters even further. And not before the two sleuths are hindered, assisted, and exasperated by the bughouse Sherlock Holmes. Fans of Marcia’s Muller’s bestselling Sharon McCone novels and Bill Pronzini’s Nameless Detective series will applaud this and future exploits from the annals of Carpenter and Quincannon, Professional Detective Services. The Bughouse Affair is mystery at it's most logical form. Marcia Muller and Bill Pronzini, a husband and wife writing team, introduce readers to the Carpenter and Quincannon Mystery series. 19th century San Francisco houses the competent Carpenter and Quincannon, Professional Detective Services. Both Sabina and John have been hired for separate jobs involving sly thieves, one a pickpocketing woman targeting men, and the other is an unidentifiable housebreaker. After being unable to apprehend suspects and going round in round in circles, their cases merge in what will be a surprising twist and unforgettable beginning. With the help of a Sherlock Holmes imposter the mystery is treated with the usual detailed observations, plus tried and true, and sometimes unorthodox, methods of deduction. While Muller and Pronzini take their time wrapping up the mystery, with the mild, casual buildup of suspense and unpredictable plot, the main characters' dealings with each other and suspects range between witty and warranting a deeper look into their personal lives. The prose of the novel is scenery-oriented, specifically the streets and neighborhoods of San Francisco. Muller and Pronzini were sure to add in tidbits, historical or fun, about the seedy or rich neighborhoods and specific streets that made it seem as though they both may have first-hand knowledge, or done very extensive research. It wasn't just the brightly colored language, but mostly the indulgence of that detailed information, which served to send readers to 1894. However, it seemed to take up time when the following scenes beckoned for attention. The Bughouse Affair is an opening novel to a series that is definitely worth taking the time to read, and continue with the next release. With much more to come of Sabina Carpenter and John Quincannon, as down-to-earth people and incredibly talented detectives, that Muller and Pronzini allude to, readers will not be able to resist!